The following article is intended for On-Premise Project Insight Enterprise customers for updating their license key for additional users. This does not require any downtime for your Project Insight users. First option you can always schedule with a Project Insight support team on updating your user count with your license key. This next option is for a Project Insight Web Server Administrator that wishes to update the license key for additional users themselves. If you encounter any issues while running the steps below when running the wizard, just click cancel the wizard will close out without making any changes and contact Project Insight Support if you prefer to have someone on our team with you during the process. On your Project Insight Web server open file explorer. Navigate to (drive letter can vary you can check IIS for location of your Project Insight web site) c:\Inetpub\ProjectInsight\bin\ProjectInsight.WebApp.Install.exe and right click the file and select "Run As Administrator". Click "Next" on every screen of the Web Application Configuration Wizard until you get to license key because the wizard will remember all your settings so no changes needed except for the license key part of the wizard. 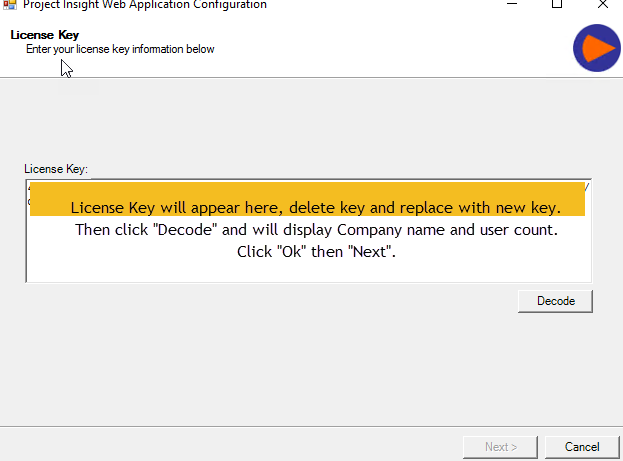 Once at "License Key" part of the configuration, delete the current key and replace with new key that was given to you. Then click "Decode" and a dialogue box will display your company name and the user count which should be your paid user plus one for our support account. Click "Ok" and then next. Next you will be present with a dialogue box asking if the database was backed up and since this is not an application update and only a license key update you can click "Yes". Now continue to click "Next" until you get to the last part of the configuration wizard and you can click "Finish"